Pelvic ultrasonography is the examination of choice, followed by magnetic resonance imaging (MRI) and/or computed tomography (CT) scanning. [5, 6, 7] The ovary may be difficult to delineate in some women who are postmenopausal, because of its relatively small size (< 2 × 2 cm), its position deep within the pelvis, and the lack of identifiable contained structures, such as cysts. [8, 9, 10, 11] Relatively simple ultrasound-based rules can be used to diagnose ovarian malignancy, such as the International Ovarian Tumor Analysis (IOTA) rules. [2, 3] The American College of Radiology, U.S. Preventive Services Task Force, American College of Obstetricians and Gynecologists, Society of Gynecologic Oncologists, and National Comprehensive Cancer Network have published guidelines on imaging for ovarian cancer (see Guidelines, below). 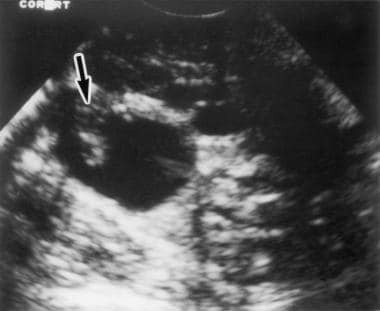 Transvaginal ultrasonogram shows the right ovary, which contains a cystic mass with a papillary excrescence (arrow). This finding is highly indicative of an ovarian neoplasm. 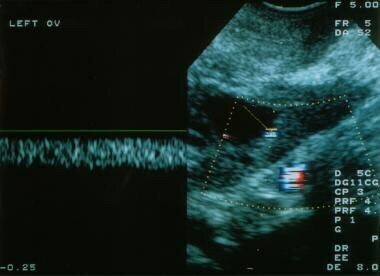 Transvaginal, color Doppler ultrasonogram shows a solid mass in the left ovary. Low impedance flow is noted within this mass, which is a clear cell carcinoma of the ovary. 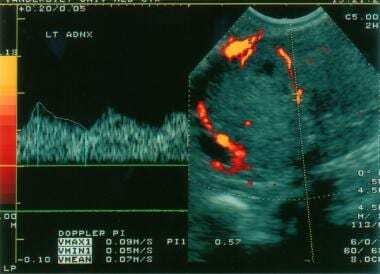 Three-dimensional, color Doppler ultrasonogram shows a cystic mass containing a vascular papillary excrescence; this is indicative of ovarian cancer. US duplex Doppler pelvis, US pelvis transvaginal, and US pelvis transabdominal are usually appropriate for the initial imaging of both premenopausal and postmenopausal women with a clinically suspected or likely adnexal mass and no acute symptoms. These examinations are complementary and should be performed together. US pelvis transvaginal, US duplex Doppler pelvis, US pelvis transabdominal, and pelvic MRI without and with IV contrast are usually appropriate for the initial follow-up of premenopausal and postmenopausal women with indeterminate adnexal mass and no acute symptoms. These examinations are complementary and should be performed together. The panel did not agree on recommending pelvic CT without and with IV contrast in postmenopausal patients with indeterminate adnexal mass and no acute symptoms. There is insufficient medical literature to conclude whether or not these patients would benefit from this procedure but it may be appropriate. CT of the abdomen and pelvis with IV contrast and pelvic MRI without and with IV contrast are usually appropriate for the initial follow-up of patients with an adnexal mass, highly suspicious for malignancy, and no acute symptoms. These examinations are complementary and should be performed together. The panel did not agree on recommending pelvic CT with IV contrast, pelvic CT without and with IV contrast, and US duplex Doppler of the pelvis in patients with an adnexal mass that is highly suspicious for malignancy and no acute symptoms. There is insufficient medical literature to conclude whether or not these patients would benefit from these procedures but they may be appropriate. 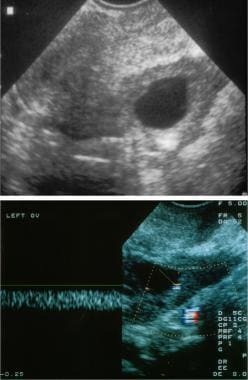 US duplex Doppler pelvis, US pelvis transabdominal, and US pelvis transvaginal are usually appropriate in the initial imaging and follow-up of pregnant patients with a clinically suspected adnexal mass and no acute symptoms. These examinations are complementary and should be performed together. For patient education information, see the Cancer and Tumors Center, as well as Ovarian Cancer. CT scanning also can aid in the evaluation of cystadenomas. A serous cystadenoma has an attenuation similar to that of water, whereas a mucinous cystadenoma has an attenuation closer to that of soft tissue. The presence of wall and septal thickness and irregularity, as well as the existence of enhancing nodules, suggests malignancy. Although CT scan findings can suggest malignancy, they are not definitive for diagnosis unless metastases are present. CT scan findings of complex functional cysts, benign ovarian tumors, and inflammatory and/or infectious masses, such as tubo-ovarian abscesses, can mimic ovarian malignancies. To determine the potential of malignancy for epithelial tumors, assessing the internal architecture is useful. In this situation, for example, gadolinium enhancement can be employed in the differentiation of solid papillary tissue (which can enhance) from clot or debris (which does not). Gadolinium enhancement is useful in the evaluation of the internal architecture of predominantly cystic lesions. In addition, if the mass is malignant, gadolinium enhancement may aid in the depiction of peritoneal implants. If a lesion is dark on T1- and T2-weighted images, it may contain fibrotic tissue and be a fibroma. Consider a fibrothecoma or Brenner tumor. Gadolinium-based contrast agents have been linked to the development of nephrogenic systemic fibrosis (NSF) or nephrogenic fibrosing dermopathy (NFD). The disease has occurred in patients with moderate to end-stage renal disease after being given a gadolinium-based contrast agent to enhance MRI or magnetic resonance angiography (MRA) scans. NSF/NFD is a debilitating and sometimes fatal disease. Characteristics include red or dark patches on the skin; burning, itching, swelling, hardening, and tightening of the skin; yellow spots on the whites of the eyes; joint stiffness with trouble moving or straightening the arms, hands, legs, or feet; pain deep in the hip bones or ribs; and muscle weakness. In a multivariate analysis, the accuracy of gadolinium-enhanced MRI in the diagnosis of ovarian malignancy was 93%. The findings most predictive of malignancy were necrosis in a solid lesion (odds ratio, 107) and vegetations in a cystic lesion (odds ratio, 40). In addition, ancillary findings, such as ascites, peritoneal metastases, and hemorrhage, on MRI scans had a high predictive value for malignancy. The use of gadolinium-based contrast agents improves tissue characterization and increases the degree of confidence for MRI findings. As with CT scans, MRI scans may depict numerous benign processes, such as complex functional cysts, tubo-ovarian abscesses, and benign tumors, that can mimic an ovarian malignancy. Malignant ovarian tumors tend to have papillary excrescences, irregular walls, and/or thick septations. [5, 1, 24, 25, 26] The tumor can contain echogenic material arising from mucin or protein debris. The more solid the areas are, the greater the likelihood that a tumor is present. Typically, intraperitoneal fluid is present; this is a sign of peritoneal spread. On color Doppler ultrasonograms, tumors tend to have vessels with low impedance because of the lack of muscular media in the vessel wall and arteriovenous shunts. The vessels tend to be clustered. Transvaginal and color Doppler ultrasonograms of stage I ovarian cancer. Top: Note the marked thickening and irregularity in the wall of this left adnexal cyst. Bottom: Color Doppler ultrasonogram shows very low impedance flow within the wall, which indicates an ovarian tumor. Note the marked thickening and irregularity of the wall of this left adnexal cyst. Color Doppler ultrasonogram shows low impedance flow within the wall, which indicates an ovarian tumor. 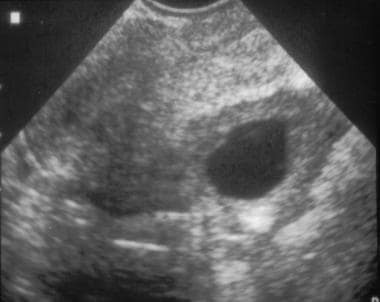 Tubo-ovarian abscesses may mimic the ultrasonographic appearance of ovarian cancer, but patients with abscesses typically present with symptoms that are attributable to an inflammatory process. What are the NCCN guidelines on imaging for malignant ovarian tumors? What is the role of imaging in the diagnosis of malignant ovarian tumors? What are the ACR appropriateness criteria for imaging evaluation of suspected malignant ovarian tumors? What are the USPSTF guidelines for ovarian cancer screening? What are the SGO/ASCO guidelines on the primary evaluation for ovarian cancer? What is the role of CT scanning in malignant ovarian tumor imaging? What is the role of MRI in the diagnosis of malignant ovarian tumors? Which ultrasound findings are characteristic of malignant ovarian tumors? Jeong YY, Outwater EK, Kang HK. Imaging evaluation of ovarian masses. Radiographics. 2000 Sep-Oct. 20(5):1445-70. [Medline]. [Full Text]. Timmerman D, Ameye L, Fischerova D, Epstein E, Melis GB, Guerriero S, et al. Simple ultrasound rules to distinguish between benign and malignant adnexal masses before surgery: prospective validation by IOTA group. BMJ. 2010 Dec 14. 341:c6839. [Medline]. Nunes N, Ambler G, Foo X, Naftalin J, Widschwendter M, Jurkovic D. Use of IOTA simple rules for diagnosis of ovarian cancer: meta-analysis. Ultrasound Obstet Gynecol. 2014 Nov. 44 (5):503-14. [Medline]. Nougaret S, Lakhman Y, Gönen M, Goldman DA, Miccò M, D'Anastasi M, et al. High-Grade Serous Ovarian Cancer: Associations between BRCA Mutation Status, CT Imaging Phenotypes, and Clinical Outcomes. Radiology. 2017 Nov. 285 (2):472-481. [Medline]. [Full Text]. Woodward ER, Sleightholme HV, Considine AM, et al. Annual surveillance by CA125 and transvaginal ultrasound for ovarian cancer in both high-risk and population risk women is ineffective. BJOG. 2007 Dec. 114(12):1500-9. [Medline]. Fleischer A. Ovarian cancer. Fleischer AC, Javitt MC, Jeffrey RB Jr, et al, eds. Clinical Gynecologic Imaging. Philadelphia, Pa: Lippincott Williams & Wilkins; 1996: 107. Yazbek J, Raju SK, Ben-Nagi J, et al. Effect of quality of gynaecological ultrasonography on management of patients with suspected ovarian cancer: a randomised controlled trial. Lancet Oncol. 2008 Feb. 9(2):124-31. [Medline]. Choi JI, Park SB, Han BH, Kim YH, Lee YH, Park HJ, et al. Imaging features of complex solid and multicystic ovarian lesions: proposed algorithm for differential diagnosis. Clin Imaging. 2015 Jul 17. [Medline]. Mansour SM, Saraya S, El-Faissal Y. Semi-quantitative contrast-enhanced MR analysis of indeterminate ovarian tumours: when to say malignancy?. Br J Radiol. 2015 Sep. 88 (1053):20150099. [Medline]. Epstein E, van Calster B, Timmerman D, Nikman S. Subjective ultrasound assessment, the ADNEX model and ultrasound guided tru-cut biopsy to differentiate disseminated primary ovarian cancer metastatic non-ovarian cancer. Ultrasound Obstet Gynecol. 2015 Apr 29. [Medline]. Fischerova D, Burgetova A. Imaging techniques for the evaluation of ovarian cancer. Best Pract Res Clin Obstet Gynaecol. 2014 Jul. 28 (5):697-720. [Medline]. [Guideline] Expert Panel on Women’s Imaging:., Pandharipande PV, Lowry KP, Reinhold C, Atri M, Benson CB, et al. ACR Appropriateness Criteria® Ovarian Cancer Screening. J Am Coll Radiol. 2017 Nov. 14 (11S):S490-S499. [Medline]. [Full Text]. [Guideline] Expert Panel on Women's Imaging: Atri M, Alabousi A, Reinhold C, et al. ACR Appropriateness Criteria® Clinically Suspected Adnexal Mass, No Acute Symptoms. American College of Radiology. Available at https://acsearch.acr.org/docs/69466/Narrative/. 2018; Accessed: December 26, 2018. [Guideline] Expert Panel on Women’s Imaging:., Kang SK, Reinhold C, Atri M, et al. ACR Appropriateness Criteria® Staging and Follow-Up of Ovarian Cancer. J Am Coll Radiol. 2018 May. 15 (5S):S198-S207. [Medline]. [Full Text]. Summaries for patients. Screening for ovarian cancer: U.S. Preventive Services Task Force reaffirmation recommendation statement. Ann Intern Med. 2012 Dec 18. 157 (12):I-56. [Medline]. Wright AA, Bohlke K, Armstrong DK, Bookman MA, Cliby WA, Coleman RL, et al. Neoadjuvant chemotherapy for newly diagnosed, advanced ovarian cancer: Society of Gynecologic Oncology and American Society of Clinical Oncology Clinical Practice Guideline. Gynecol Oncol. 2016 Oct. 143 (1):3-15. [Medline]. [Guideline] National Comprehensive Cancer Network. National Comprehensive Cancer Network. NCCN Clinical Practice Guidelines in Oncology, Ovarian Cancer Including Fallopian Tube Cancer and Primary Peritoneal Cancer. National Comprehensive Cancer Network. Available at http://www.nccn.org/professionals/physician_gls/pdf/ovarian.pdf.. November 9, 2017; Accessed: February 27, 2019. American College of Obstetricians and Gynecologists Committee on Gynecologic Practice. Committee Opinion No. 477: the role of the obstetrician-gynecologist in the early detection of epithelial ovarian cancer. Obstet Gynecol. 2011 Mar. 117 (3):742-6. [Medline]. Buy JN, Ghossain MA, Moss AA, et al. Cystic teratoma of the ovary: CT detection. Radiology. 1989 Jun. 171(3):697-701. [Medline]. [Full Text]. Vargas HA, Huang EP, Lakhman Y, Ippolito JE, Bhosale P, Mellnick V, et al. Radiogenomics of High-Grade Serous Ovarian Cancer: Multireader Multi-Institutional Study from the Cancer Genome Atlas Ovarian Cancer Imaging Research Group. Radiology. 2017 Nov. 285 (2):482-492. [Medline]. [Full Text]. Kitajima K, Kaji Y, Kuwata Y, et al. Magnetic resonance imaging findings of endometrioid adenocarcinoma of the ovary. Radiat Med. 2007 Aug 1. 25(7):346-54. [Medline]. Okamoto Y, Tanaka YO, Tsunoda H, et al. Malignant or borderline mucinous cystic neoplasms have a larger number of loculi than mucinous cystadenoma: a retrospective study with MR. J Magn Reson Imaging. 2007 Jul. 26(1):94-9. [Medline]. Hricak H, Chen M, Coakley FV, et al. Complex adnexal masses: detection and characterization with MR imaging--multivariate analysis. Radiology. 2000 Jan. 214(1):39-46. [Medline]. [Full Text]. Bourne TH, Campbell S, Reynolds KM, et al. Screening for early familial ovarian cancer with transvaginal ultrasonography and colour blood flow imaging. BMJ. 1993 Apr 17. 306(6884):1025-9. [Medline]. [Full Text]. Fleischer AC, Cullinan JA, Peery CV, et al. Early detection of ovarian carcinoma with transvaginal color Doppler ultrasonography. Am J Obstet Gynecol. 1996 Jan. 174(1 Pt 1):101-6. [Medline]. Schulman H, Conway C, Zalud I, et al. Prevalence in a volunteer population of pelvic cancer detected with transvaginal ultrasound and color flow Doppler. Ultrasound Obstet Gynecol. 1994 Sep 1. 4(5):414-20. [Medline]. Iyer VR, Lee SI. MRI, CT, and PET/CT for ovarian cancer detection and adnexal lesion characterization. AJR Am J Roentgenol. 2010 Feb. 194 (2):311-21. [Medline]. Tanaka YO, Okada S, Yagi T, Satoh T, Oki A, Tsunoda H, et al. MRI of endometriotic cysts in association with ovarian carcinoma. AJR Am J Roentgenol. 2010 Feb. 194 (2):355-61. [Medline]. Surgery to Reduce Ovarian Cancer Risk — One Step or Two?